Hope everyone had a great weekend and all the Dads got spoiled yesterday! We had a nice day, filled with fun and food. The weather was gorgeous which made it all even better. My original intent with these cookies was to make them into ice cream sandwiches…but, they were gobbled up WAY too fast. Almost as fast as it was for me to make them. Only 4 ingredients, people! Wish I’d made more. Next time it’s a double batch, and they WILL be stuffed with ice cream! Preheat oven to 350 degrees. Combine cake mix, eggs and oil, and mix until smooth. Add chips and stir. Chill dough in fridge for 45 minutes. 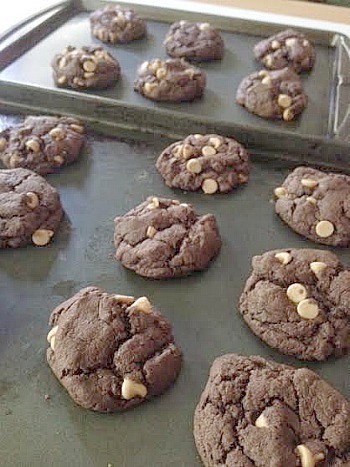 Drop dough onto ungreased cookie sheets in rounded balls (make bigger ones for bigger cookies or ice cream sandwiches!). Bake for around 9-10 minutes, depending on size. This entry was posted in chocolate, cookies, dessert, peanut butter, QuickAndEasy. Bookmark the permalink.